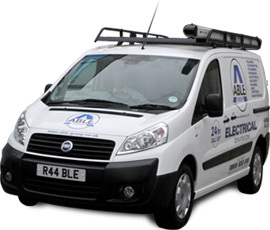 Able Electric services have been an established part of the UK local community for many years now. With no call out charge and 24 Hour* emergency electricians covering almost anywhere in the UK, Able Electric has received many compliments and recommendations on our customer services and ability to carry out the job professionally, safely and efficiently. With professional electricians, we are able to deliver an emergency response and because of this we offer our electrical repair, maintenance and installation services to commercial account customers so that you have the peace of mind that any electrical services will be carried out within 30-90 minutes. We understand that commercial properties need to be fully functional and secure 24/7 and because of this Able Electric provide a reactive electrical service 365 days a year. Our aim as a company is to provide a service that is second to none, and our procedures are continuously under review to ensure that targets are being met, and we have won several awards for our customer service. Our offices are manned 24 hours a day 365 days a year, so our customers never have to speak to an answering machine. Our experienced staff are always on hand to take your call personally, ready to pass the details on to our network of qualified electricians up and down the country. The progress of the job is then carefully monitored from the initial call through to job completion, with regular updates on job progress and arrival times relayed directly to the customer. Our modern fleet of electrical vehicles are fully stocked so that wherever possible the work can be completed within the first visit to site.